The Objectives of this Study: The objective of the study was to evaluate the efficiency of diode laser 940 nm in both, continuous and pulsed modes. Then compare the outcomes of frenectomy procedure, and find the best mode that satisfies the patient's and the surgeon's criteria. Materials and Methods: This study was carried out on 14 patients of which 7 were males and 7 were females with age range from 7 to 46 years. Patients underwent diode laser-assisted frenectomy in continuous wave (CW) mode with power ranging from 1.5–3 W and pulsed mode, which was subdivided into comfort pulse 0 (CP0) with 6–10 W peak power; 1.2–2 W average power and CP2with 2–10 W peak power; 1–5 W average power. Anesthesia method and need, the duration of surgery and intraoperative bleeding events were recorded in all cases. In addition, patient preoperative fear, perception and comments were reported. Ratings of the postoperative pain and the functional complications for each patient in a questionnaire survey were reported using the Wong-Baker FACES Pain Rating Scale at operation day throughout the 1st week postoperatively. All patients were examined at 2, 7, and 21 days after the operation in order to assess the surgical wound healing. Results: In the clinical study, seven patients were operated on without infiltration anesthesia (only spray anesthesia) in the pulsed mode while in CW-mode only one patient operated on with spray anesthesia in low power. Intraoperative bleeding events were bloodless to oozing. There was no preoperative fear; patients' perceptions were comfortable with satisfactory comments except in CW cases and some of the CP0 cases. Severe postoperative complications were absent in all subjects. The reported survey results indicated that the patients treated with the laser had normal day activity on operation day, less postoperative pain and fewer functional complications were noticed in the CP2mode. The surgical wound healing was within normal limits in 7–14 days. Carbonization was the main feature of cases treated with CW-mode while it was mostly absent in the pulsed mode. Conclusion: The use of CW-mode of diode laser can be considered no more suitable for performing oral soft tissues surgery. The pulsed mode was found more practical, effective and easy to carry out incisions, cuttings with less intra and postoperative complications considering its advantages in the clinical cases. The CP2pulsed mode laser treatment offers a safe, effective, acceptable, with impressive outcomes particularly for young patients. Esthetic concerns have led to an increasing importance of seeking dental treatment, with the purpose of achieving perfect smile. The continuing presence of a diastema between the maxillary central incisors in adults has often been considered as an esthetic problem. The presence of an aberrant frenum is being one of the etiological factors for the persistence of a midline diastema. The focus on the frenum has become essential. Lingual frenulum evaluation is required when tongue movements and orofacial functions, such as chewing, swallowing and speech are altered.,,, Different health professionals use their knowledge to evaluate lingual frenulum. In general, anatomy and orofacial functions are evaluated. The use of specific protocols is not common. Surgery is indicated when orofacial functions are significantly altered. Frenectomy is the usual procedure to release the lingual frenulum. Until, the classical or conventional frenectomy (surgically by scalpel and suturing) was the only way to remove the aberrant frenum. Modern technology now offers an alternative mode of treatment, like laser surgery. The poor absorption in the surrounding tissues (only 20% of the emitted energy penetrates deeper than 2 mm) allows the surgery to be performed safely., Surgery is usually performed in the continuous mode, but the recently produced super pulsed diode laser allows the surgeon to perform interventions with very high energy levels and frequency up to 20,000 Hz with a pulse duration in the millisecond range. In this way, the thermal damage to the tissue does not progress deeper than 50 µm, and carbonization is reduced to a minimum. 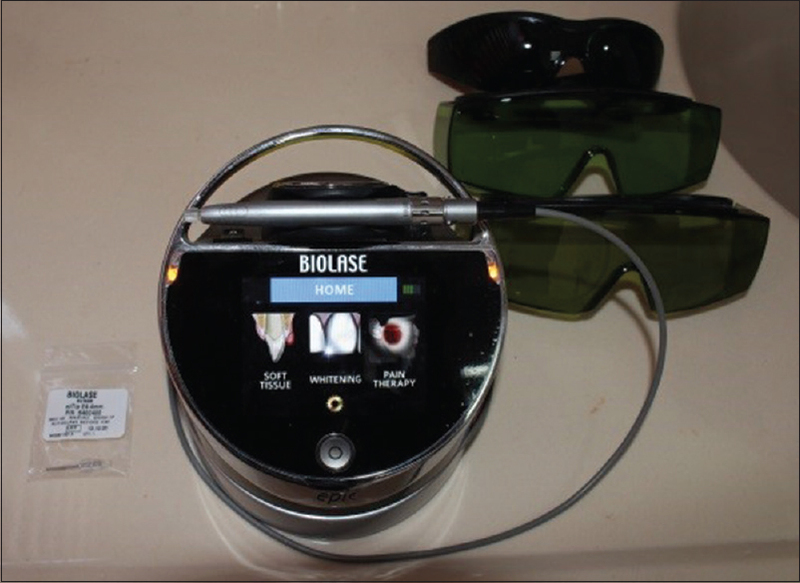 The used laser system in this study was the Epic ™ 10 W diode laser 940 nm, Biolase Company, USA, which is a surgical and therapeutic device at the cutting edge of technology, designed for a wide variety of oral soft tissue procedures and dental whitening, as well as for use in providing temporary relief of minor pain. The Epic ™ 10 utilizes a solid-state diode as a semiconductor source for invisible infrared radiation. The energy is delivered to the treatment site via flexible fiber connected at one end to the laser source and the other end to the Handpiece. Various types of single-use, disposable tips are designed and optimized for different applications. The device is activated by means of a wireless footswitch [Figure 1],[Figure 2],[Figure 3]. This clinical trial included fourteen patients requiring surgical removal of labial and\or lingual frenum, attending the Specialized Dental health center of Duhok in Kurdistan and at Al-Ramady Specialized Dental Health Center in Al-Anbar governorate. Dental oral surgeons and periodontists from both dental centers supervised the operations of frenectomy with specialist in laser dentistry. The study was carried out from September 2013 to September 2014. Fourteen patients of both sexes (7 females, 7 males) with age range from 7 to 46 years were asked to undergo the laser therapy in this clinical trial and the details of the procedure, possible complications were explained verbally, and each patient was given a written sheet. Inform consent was obtained. Patient should be able and willing to take part in this study, follow all the instructions, and come back during the observation periods. Patient with bad oral hygiene (negligible patient). A special case sheets and follow-up sheets were done for each patient; it is presented in the [Figure 4]a and [Figure 4]b. The information case sheet was filled by the operating dentist before and after operation, while the follow-up case sheet was given to the patient or the parents in case of pediatric patient to fill the information for a period of 7 days. Need for postoperative medicaments (antibiotics and analgesics). The procedure of labial/lingual frenum removal using Epic diode laser 940 nm was performed first depending on the device-preset parameters for frenectomy since it has groups of treatment modalities as shown in [Figure 5]. In soft tissue group, frenectomy item has the following preset parameters [Table 1]. Repeat initiation process as needed to ensure the tip is initiated. The procedure presets installed at the factory are based on clinical recommendations and feedback from experienced laser dentists. A 300 μm tips are recommended for removing thin tissue layers while the 400 μm tips are recommended for removing fibrous tissue (so we used the 400 μm tips in our procedures) [Table 2]. Clinical judgment was adopted when selecting power, pulse, length, and pulse interval parameters to ensure optimal clinical results. The recommended settings apply only to the 300 μm and 400 μm tips. 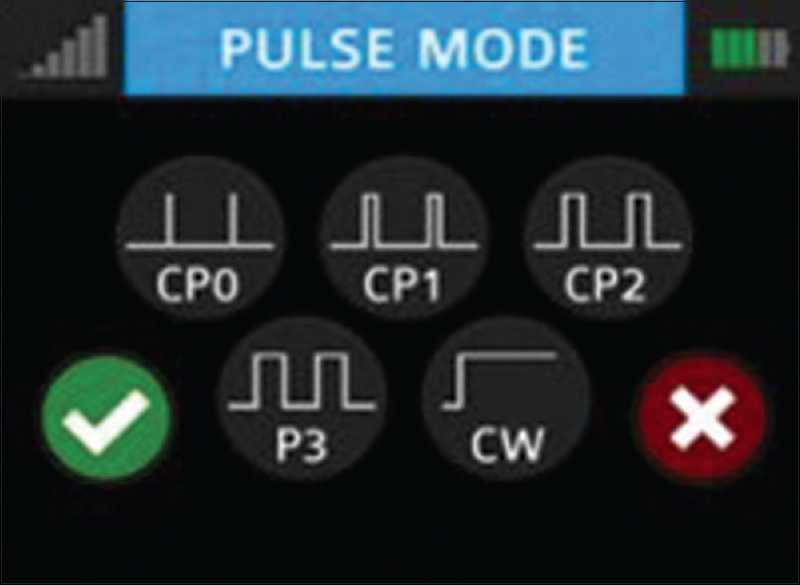 P3 pulsed mode which is the standard for most diode lasers currently available to the dental market. Therefore, starting this study with the preset parameters then adjusting the parameters to observe the clinical effects on the surgical area, the patient perception and the dentist optimum parameters for performing frenectomy. The used parameters in the study had the following specifications as shown in [Table 3]. The frenum was irradiated in contact mode. The follow-up visits were after 48 h, 7 days and 21 days postoperatively. The tongue was retracted upward and posteriorly. After each laser exposure, the surgical site was wiped off with normal saline wet cotton roll. The duration of surgery and intraoperative bleeding events (bloodless, oozing, mild, moderate, severe bleeding), were recorded in all cases. In addition, the patient's perioperative fear, perception, and comment were recorded. With a clean finger, rub vigorously under the tongue, side to side and across the middle, 3 times. Place your index fingers on each side of the tongue and forcefully open the diamond shaped area. A sufficient force may be needed to completely open the surgical site to prevent the reattachment. Push downward toward the child's throat. Some bleeding may occur, and this is not a concern. The same operator during examination did the clinical observations and assessments. In addition to the data collected from the questionnaire sheets including the patient's notes in the operation day and during the 1st week postoperatively. Assessment of pain was done using the Wong-Baker FACES Pain Rating Scale, the severity of pain was assessed using scale of 0 (no pain) to 5 (severe pain) a copy of which was given to each patient to allow daily recording of pain at the day of operation and the first 7 postoperative days. In addition, postoperative pain was assessed according to systemic analgesic usage. Severe: Edema involving the inner and outer sides of the involved lip and extending beyond the corner (commissures) of the mouth and the nasolabial folds laterally, involving (reaching) the nose in upper or the chin (lower border of mandible) in lower. In addition, the duration of the swelling subsiding was recorded. The researcher did clinical assessment of the wound infection and necrosis during the postoperative period at 2, 7 and 21 days. In the follow-up appointments, the operator was asking each patient to describe and rank their functional abilities that include speaking, eating, and brushing whether were normal, limited, painful or hardly. In addition to the data collected from the questionnaire sheet. In addition, the duration of a clinically healed wound was recorded. The results were subdivided into instant results of the operation and follow-up visits results. These were tabulated to compare the outcomes of different parameters. Duration of operation (in minutes). Follow-up visits were at 48 h, 7 days, 21 days. We started from the device parameters, which is 2 W CP2 pulsed mode for frenectomy and changed the parameters in an ascending mode. In CP2 mode, the pulse duration was 1 msond on, pulse interval 1 msond off and duty cycle (time on/time off) is 50%. The operative results are directly taken as shown in [Table 7]. The follow-up results were recorded at 48 h, 7 days and 21 days as shown in [Table 8] and [Figure 11] and [Figure 12]. In CP0 mode, the pulse duration was 10 μs on, the pulse interval 40 μs (off) and the duty cycle (time on/time off) was 20%. The operative results are directly taken as shown in [Table 9] with the same parameters to be checked. The follow-up results were recorded at 48 h, 7 days and 21 days as shown in [Table 10] and [Figure 13] and [Figure 14]. On pictures taken after the surgical procedure, the wound areas looked much nicer when pulsed mode laser did the treatment. The cutting margins had sharper edges; the cut was straighter and seemed to go deeper into the tissue with one movement. The following days there was a swelling of the treated soft tissue in different sizes noticed for the laser systems. After 2 days, there was only a mild swelling left after pulsed diode laser treatment but in the CW-mode group 40% of the patients still had a moderate swelling. One-week after laser treatment, there was no swelling left in both laser groups. Fibrin layer: [Table 16] and [Table 17]. 1-week postoperative there was more reduction of fibrin layer in the CW-group while the pulsed mode group still had a partial fibrin covered area in 20% of the patients in CP2 and CP0 modes. During laser treatment and directly after laser treatment no patient felt pain or discomfort because there was anesthesia given in every treatment case. There were more patients without pain, and the pain strength was on a lower level in the pulsed group type CP2[Table 18]. Now there were no patients with pain grade 2 in the CP2 and CP0 pulsed mode group and less patients with pain grade 2 in the CW-mode group. After 1-week, all patients in CP2 group were free of pain, the CP0 group and the CW-group still has pain grade 1 [Table 19]. Difficulties in oral hygiene [Table 22]. Discussing the results from the study one certain thing has to be remembered, the CW-mode laser had been used in an ascending pattern for the power and the peak and average power had always be the same; in every procedure. That's the main difference to the pulsed laser which had been used with different parameters; for the CP2 mode from 2 to 10 W peak power; 1–5 W average power; 1 ms pulse duration and 50% duty cycle while for the CP0 mode; 6–10 W peak power; 1.2–2 W average power, 10 µs pulse duration with 20% duty cycle. The used peak power was sometimes higher than the peak power of the CW-mode laser. 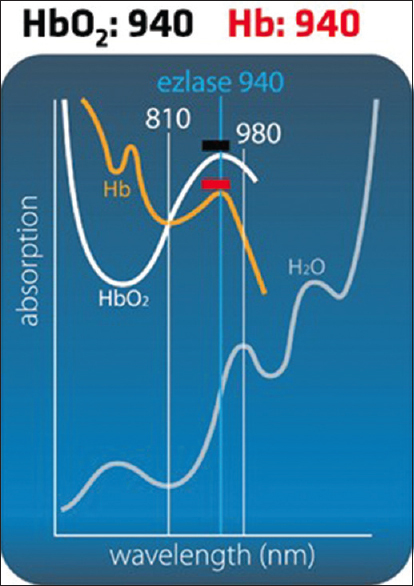 In this study, we used a 940-nm diode laser because it has maximum absorption by hemoglobin and oxyhemoglobin, compared to 810 nm [Figure 15]. When compared to 980-nm diode lasers, the higher thermal effect of these wavelengths (<100 μs) can very often cause necrosis. The use of high powers, short pulse durations and high frequencies offered a high speed for cutting and a deeper cut as it did in CW-mode. The margins of the cut were more defined and straighter using super pulsed mode.,, When using the super pulsed diode with high power and frequency for cutting the first time, the normal treatment behavior had to change; the movement speed of the fiber had to be increased because of the rapid cutting velocity. When using the CW-diode laser the cut was flattish, and the cutting speed was low in low powers. As known the cutting efficiency of an 810 nm diode laser is better than it is with a 980 nm diode (Gutknecht N; script M6-Master of Science in Lasers in Dentistry, ED2006; AALZ-Aachen; 02/2008). The 810 nm diode has less penetration into the depth, a lower absorption in water, a lower absorption in HbO2 and nearly the same absorption in Hb as a 980 nm diode. The 980 nm diode creates more thermal energy at the surface and penetrates more into depth. The zone of necrosis is larger and it is more dangerous for cutting. In this study, we used 940 nm wavelength diode laser because of better absorption as mentioned in [Figure 15]. Surprisingly Bach et al. could prove 2008 in vitro studies, that there was no difference from the histological point of view between 810 nm and 980 nm diode lasers, when both are used in the same mode of operation. If we assume that Bach's results were correct, and we neglect the difference between in vitro and in vivo studies, we can conclude together with the attained results from this study that super-pulsed mode of operation will lead to faster cutting speed and a more precise cut with less tissue damage. There are a lot more parameters apart from the wavelength, power, frequency, pulse duration, fiber diameter and mode of operation that will influence the cutting ability, so as e.g. : Kind of tissue, pigmentation, race, blood circulation in tissue, applied dose, treatment time etc. However, these parameters are of subsidiary relevance in this study. Next point to view is the carbonization of the tissue. If there is a lot of carbonization, the destruction of the surrounding tissue is large.,,, Carbonization is changing the absorption of the treated tissue; it is increasing due to the dark color, which absorbs the diode laser light much better than light colors do. This means there is more thermal energy applied to the surface and necrosis of the adjacent structures is created. As we can see from the study, the changing of parameters could influence the degree of carbonization and coagulation. In 1999 Goharkhay et al. stated that the horizontal and vertical dimension of the tissue destruction is neither addicted to the diameter of the fiber, nor related to the mode of operation (CW or pulsed) but is only depending on the average power used. Both assumptions could be rebut until today. Using the same power settings the dose applied in a defined treatment time is lower with a larger fiber diameter. In using smaller fiber diameters the applied energy is distributed in a smaller area, the dose is higher, the effect is larger, there is more thermal energy brought into the tissue. The risk of carbonization is increasing. So the tissue destruction is certainly related to the diameter of the fiber. The used average power in case of CW-mode diode laser was the same as the peak power reached at max parameter in this study 3 W; in case of the pulsed mode CP2, maximum average power reached was 5 W. According to Goharkhay, the tissue damage must be larger when using the CP2 mode because of the higher average power, but it was just the opposite, because the mode of operation was changed. Also, a much smaller degree of carbonization and destruction is described when using pulsed instead of CW-mode.,,,,,,, This can be consolidated by the results achieved here. The CW-mode laser produced carbonization in almost every treatment case, 80% except at low power 1.5 W. The CP2 pulsed diode laser in total 60% with different grades of carbonization of the cases and 40% in total in CP0 group. No patient with heavy carbonization in both pulsed groups. In the CW-mode group, 20% had heavy carbonization; the total amount of carbonization was much higher in the CW-mode group. Maybe carbonization could have been less in the super pulsed group regarding the treatment practice because the fiber had to be moved much faster as in CW-mode and the surgeon had to adapt to the new procedure technique. The fiber diameter is another factor for the applied dose, and perhaps the carbonization could have been decreased using a larger fiber; but for better comparison both modes of diode laser were used with 400 µm fibers. All other parameters, which could influence the degree of carbonization, such as peak power, average power, frequency, pulse duration etc., were accepted in the way the manufacturers had programmed the diode laser unit. Next aspect to discuss is the coagulation ability of both modes of operation. In this study the coagulation efficiency is described as little, good ,,,,,, to very good ,,,, for CW-mode. For super pulsed mode the coagulation mentioned is very good ,, and good. Geldi C et al. described 2006 in a study that super pulsed diode lasers have a larger coagulation area but smaller carbonization area as CW-mode diode lasers. In this study, the gained results from the surgeon's questionnaire demonstrated in direct comparison that coagulation was stronger using CP0-mode. During treatment, the coagulation was very good in 80% and good in 20% of the treated patients with CP0 mode. For CW, there was very good coagulation in 60% and good in 20% and little coagulation in 20% of the treated patients, which meant that a few patients had a minimal bleeding in low power CW-mode, which was 1.5 w. In pulsed mode, there was none. In this often no bleeding after surgical treatment is mentioned ,,,,,, but there was an oozing bleeding in the CW-group patients after surgery. This result was different from the results obtained by Dr. Ralf Borchers 2008 in a study where the gained results from the surgeon's questionnaire demonstrated in direct comparison that coagulation was stronger using CW-mode. The coagulation was very good in 42,86% of the treated patients and good in 57,14%. For super pulsed there was no very good coagulation, but 83,33% good and 16,67% little coagulation where a few patients had a minimal bleeding. In CW-mode there was none, while there was an oozing bleeding in 21,43% of the CW-group patients after surgery and also in 41,67% of the super pulsed group after finishing the surgical treatment, which is a significant difference. This difference between the current study and Ralf study could be explained by means of power parameter, Ralf used in his study single CW power parameter that was stable for all patients, which was 2.5 W which is significantly higher than 1.5 W parameter used in the current study where bleeding occurred with, while in higher powers there were no bleeding at all. This might have been a derivation of the higher thermal damage of the CW-mode laser. The blood vessels were sealed better by the influence of the larger amount of thermal energy delivered by the CW-mode of operation. Swelling of the wound area and adjacent tissue 2 days after surgery was significantly less in the super pulsed group. It was 100% mild swelling in both CP0 and CP2 pulsed modes while in CW-mode it was 60% mild and 40% moderate. The reason for this could be the degree of tissue damage caused by laser irradiation. Regarding the lower degree of carbonization and thermal damage in the super pulsed group, it was explainable that there was less swelling. Swelling is a result of the inflammation reaction of the body. A second characteristic sign of inflammation is pain. During and directly after laser treatment there was no pain because all patients had been given local anesthesia. Surgical treatment with a diode laser always requires anesthesia, because the thermal energy always applied generates pain. In this study classifications of pain were 0 no pain, 1 slight annoying, 2 little pain, 3 more than little pain, 4 lots of pain, 5 very strong pain. All authors agree that the degree of pain is reduced after laser treatment in comparison to classical treatment by scalpel. Looking to the results of the questionnaire only patients treated with CW-mode had the higher degree of pain, which was grade 5 that occurred 1-day after treatment. The percentage was 20% while none of the patients treated with pulsed mode had pain grade 5. In the next 48 h from treatment pain grades were between zero, one and two. The best mode in results of pain was the CP2 mode where its percentages were as the following 50% pain-free, 50% pain grade 1. The CP0 had 20% pain-free, 80% grade 1 and the CW-mode 20% pain-free, 40% grade 1, 40% grade 2. After 1-week, still CP2 had the best results, which were 100% pain-free. The CW and CP0 still had pain with lower percentages. Saaleh et al. noticed an average of 3 days of pain for all patients in their study after CW-mode treatment. One week after surgical laser treatment, no patient felt pain any longer (exception: The very algesic patient on grade 5). The controversy here was the CP0 mode results. In this mode were the pulse duration shorter than the CP2, 10 µs for CP0 and 1 ms for CP2. So the amount of laser energy applied to the tissue in contact logically was large, condense and thermal damage to the tissue was minimal due to short exposure time. However, the results here showed that CP2 mode was better in the pain parameter, In spite the fact that pulse duration is longer in this mode. After laser treatment the patients had been supplied by an analgesic drug, Ponstane cap 500 mg. The patients in the CW-group and CP0 needed medication more than the patients in the CP2 mode group. These results corresponded to the findings for pain that have been done before. In general, we can say that the pain sensation was less in the pulsed group. These results and the following conclusions for reduced masticatory and lingually function so as the difficulties in oral hygiene were subjective and will differ by treating other patients because the degree of sensation is very different from person to person. There will be no reproducable results but only a hint to the right direction. In order to the traumata, set during laser treatment there was a functional reduction for masticatory and/or lingually function in both groups. In the CW-group, every patient was affected except for one. In the pulsed group, type CP0 60% of the patients had no functional limitations while 20% had it for 2 days and 20% for 1-week. The best results again were for the CP2 mode were 100% of the patients were symptoms free. That corresponded once again to the study of Saaleh et al., who described a 3-day period of painful mastication and speech after CW-mode treatment. Nearly the same results for oral hygiene. In CW-mode limitations ranging from one to whole week, while for CP0 only 40% suffered limitation. Again the best results were 100% no limitations for CP2. The building of fibrin is a part of the secondary hemostasis, a part of the plasmatic hemostasis. A dense network of fibrinous fibers connected the thrombocytes. The grade of fibrin layer relies in a certain extent to the grade of healing. The faster the fibrin layer is removed, the faster the wound healing is in progress. After 2–4 h trauma the extravasation starts, a coagulum is built with blood and plasma cells on the wound surface. Fibrin fibers are connecting the thrombocytes and build a dense network of fibers. This normally lasts to the 4th day. Then proliferation starts, granulated tissue is build, and the fibrin fibers are reduced. From the 5th day on regeneration starts and there is no more fibrin layer. The faster the fibrin layer is removed, the faster the wound healing is in progress. The observed results regarding the fibrin layer differed from the normally seen wound healing after classical treatment by scalpel. In this study, 14 patients were treated, no suture was needed, so there was secondary wound healing or second intention, and visible fibrin layer could be seen. On 48-h postoperation, thick fibrin layer was seen on the wounds in 100% of all patients. In comparison to healing after conventional surgical treatment, there was a delay of healing time, because fibrin layer building started later and needed more time to cover the wounds. In conventional surgical treatment, primary intention was obtained by suturing. In consequence of delayed wound healing, there was still a fibrin layer seen after 1-week in 20% of the pulsed group and in 0% of the CW-group. Delayed wound healing after surgical diode laser treatment has been described in literature already ,, and as we could see from the results above the wound healing of the CW-group started later and lasted even longer as the prolonged wound healing of the super pulsed group. This might have been an effect of the stronger thermal damage and increased carbonization in the CW-group. The cells and blood vessels in the adjacent tissue were much more damaged and needed longer to reorganize for healing. Super pulsed treatment left more intact tissue at the wound margins, so healing could begin earlier as in CW-mode. Even if there was an improvement in healing time, there was still a difference to normal healing, where fibrin layer removal begins already at the end of the 4th day. Therefore, the intactness of the tissue seemed to be essential for regular wound healing. Super pulsed diode laser treatment did not cause much carbonization, but there was as well coagulation, which meant applied thermal energy on the blood vessels and cells; causing damage and therefore delayed healing. As option for surgical laser treatment an Er: YAG laser with water spray and air can be used instead. The Er: YAG laser also generates a soft tissue cut, but with a resulting bleeding. There will be no carbonization and nearly no coagulation, therefore, no or only minimal damage to the tissue and as effect a much quicker and nicer wound healing and less discomfort for the patient as after diode laser treatment. In summary we can say that super pulsed diode laser treatment is contrary to CW-mode diode laser treatment much more gentle for the tissue (less damage, quicker healing), more comfortable for the patient (less pain and swelling) and an improvement for the surgeon (more precise and deeper cut, less burnt smell, shorter treatment time). Only the coagulation ability of the super pulsed diode laser seems to be minimal inferior of the CW-mode diode laser. In combination with the findings of the Bach study  and the case reports of Maiorana and Salina  we can conclude that super pulsed diode lasers should be the state-of-art treatment nowadays if there is spoken about surgical diode laser treatment. Of course, these are only 2 further studies, and the results have to be reconfirmed by various studies with a larger amount of patients, but the direction to go is clearly given. Clinical in vitro and in vivo studies have shown that soft tissue surgery done by super pulsed diode lasers is more reasonable as doing the same procedures by CW-mode diode lasers. Carbonization and thermal damage to the adjacent tissue can be reduced to a minimum, the soft tissue cut can be generated faster, and the cut is more precise. Because of the lower amount of tissue destruction, the healing is faster as in CW-mode. It is more comfortable for the patients regarding the postoperative pain and swelling, the patients will need less drugs, and the functional abilities are not reduced as much as in CW-mode. In terms of Bach's histological investigation of the treated soft tissue  we probably have to share his opinion, that CW-mode diode lasers are no longer suitable for soft tissue cutting in dentistry. The advantages of the super pulsed diode lasers in soft tissue surgery are evident and with the meanwhile achieved peak powers, the very short pulse durations and the high frequency the surgical treatment can be improved and probably the range of treatment can be expanded. Jhaveri H, editor. The aberrant frenum. In: Dr. PD Miller the Father of Periodontal Plastic Surgery.J Periodontol 2006. p. 29-34. Nogueira GR, Benatti BB, Bittencourt S, Peruzzo DC, Casati MZ. Frenectomy Associated With Free GingivaL GrafT. Rev Gaúcha Odontol 2005;53:85-164. Suter VG, Bornstein MM. Ankyloglossia: Facts and myths in diagnosis and treatment. J Periodontol 2009;80:1204-19. 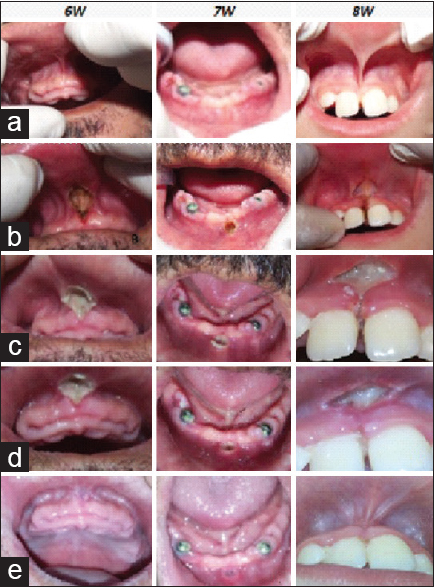 Hooda A, Rathee M, Yaday S, Gulia J. Ankyloglossia: A review of status. Internet J Otorhinolaryngol 2010;12. Johnson PR. Tongue-tie– exploding the myths. Infant 2006;2:96-9. Lee HJ, Park HS, Park BS, Choi JW, Koo SK. The Improvement of tongue mobility and articulation after frenotomy in-patient with ankyloglossia. J Otorhinolaryngol Head Neck Surg 2010;53:491-6. Hong P. Ankyloglossia (tongue-tie). Published ahead of print October 15,2012; DOI: 10.1503/cmaj.120785. Marchesan IQ. Tongue frenulum evaluation protocol. Rev CEFAC 2010;12:977-89. Darshan HE, Pavithra PM. Tongue tie: From confusion to clarity-A review. Int J Den Clin 2011;3:48-51. Braga LA, Silva J, Pantuzzo CL, Motta AR. Prevalence of change in frenulum lingual and its implications in speech of school childrenRev CEFAC 2009;11:378-90. Oredsson J, Törngren A. Frenotomy in children with ankyloglossia and breast-feeding problems. A simple method seems to render good results. Lakartidningen 2010;107:676-8. Knox I, Tongue-tie and frenotomy in the breastfeeding Newborn. Neoreviews 2010;11:513-9. Epstein SR. The frenectomy: A comparison of classic versus laser technique. Pract Periodontics Aesthet Dent 1991;3:27-30. Fisher JC. Qualitative and quantative tissue effects from important surgical laser. Laser Surg Gynecol 1993; 1:58-81. Gontijo I, Navarro RS, Haypek P, Ciamponi AL, Haddad AE. The applications of diode and Er: YAG lasers in labial frenectomy in infant patients. J Dent Child (Chic) 2005;72:10-5. Martelli FS, De Leo A, Zinno S. In: Masson, editor. Laser in Odontomatologia: Applicazioni Cliniche.CAP.5.P 59-60. Milan: Masson S.P.A, 2000 p. 59-60. Maiorana C. Laser in the treatment of soft tissue lesions. J Oral Laser Appl 2003;2:7-14. Moritz A. Orale Lasertherapie. Berlin: Quintessence; 2005. p. 41-5. Goharkhay K, Moritz A, Wilder-Smith P, Schoop U, Kluger W, Jakolitsch S, et al. Effects on oral soft tissue produced by a diode laser in vitro. Lasers Surg Med 1999;25:401-6. Maiorana C, Salina S. Versatility of superpulsed diode laser in oral Surgery: A clinical report. J Oral Laser Appl 2006;6:193-9. Gouw-Soares S, Tanji E, Haypek P, Cardoso W, Eduardo CP. The use of Er: YAG, Nd: YAG and Ga-Al-As lasers in periapical surgery: A 3-year clinical study. J Clin Laser Med Surg 2001;19:193-8. Wigdor HA, Walsh JT Jr, Featherstone JD, Visuri SR, Fried D, Waldvogel JL. Lasers in dentistry. Lasers Surg Med 1995;16:103-33. Horch HH. Laser in oral surgery. Berlin: Internationalen Jahreskongress der DGL; 2002. Luomanen M, Virtanen I. Healing of laser and scalpel incision wounds of rat tongue mucosa as studied with cytokeratin antibodies. J Oral Pathol 1987;16:139-44. Goharkhay K, Moritz A, Schoop U, Pattera C, Rumetzhofer A, Wernisch J, et al. Effect of different laser wavelengths on the oral mucosa – an in vitro study. Stomatologiia 2000;97:173-9. Stock K, Hibst R. Comparative in vitro study of Diode Laser (940 nm) and Nd: YAG laser for oral surgery. Florence: Lecture Laser Congress; 2003. Rosenberg C, Tadir Y, Braslavsky D, Fisch B, Karni Z, Ovadia J. Endometrial laser ablation in rabbits: A comparative study of three laser types. Lasers Surg Med 1990;10:66-73. Gáspár L. The use of high-power lasers in oral surgery. J Clin Laser Med Surg 1994;12:281-5. Bach G, Gutknecht N, Schneider H. Laser therapy in the Dentistry. Diode laser in practice. Linnich: Apollonia Verlag; 1998. Moritz A. F, Beer F, Goharkhay K, Schoop U, Strassl M. Orale Lasertherapie. Berlin: Quintessence Verlag; 2006. Frentzen M, Koort HJ. Laser technology in dentistry. Dtsch Zahnarztl Z 1991;46:443-52. Walinski CJ. Irritation fibroma removal: A comparison of two laser wavelengths. Gen Dent 2004;52:236-8. Gutknecht N. Laser Therapy in Dental Practice. Berlin, Chicago, London: Quintessenz Verlag; 1999. Gutknecht N, editor. Proceedings of the 1st international workshop of evidence based dentistry on lasers in dentistry. New Maiden: Quintessence;2007. Mester E, Spiry T, Szende B, Tota JG. Effect of laser rays on wound healing. Am J Surg 1971;122:532-5. Pick RM, Powell GL. Laser in dentistry. Soft-tissue procedures. Dent Clin North Am 1993;37:281-96. 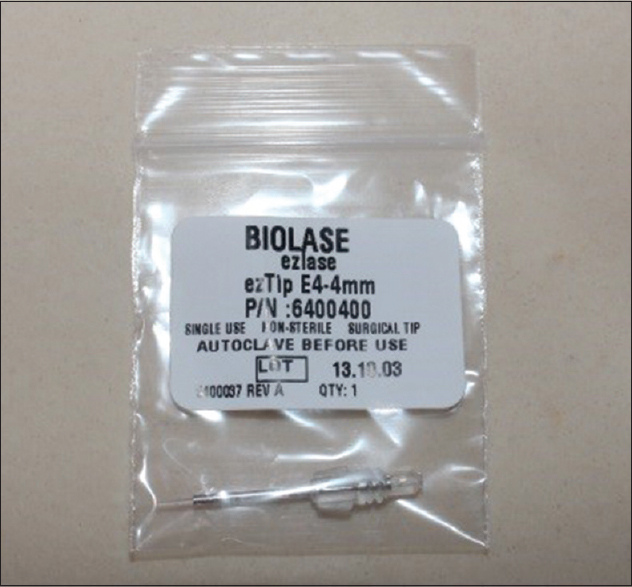 Meister J, Franzen R. Dental Laser Systems Part II: Diode laser. DGL Journal of Laser Dentistry 2007;3/07:185-9. Black P. The dental laser in oral surgery -master piece- Part2. 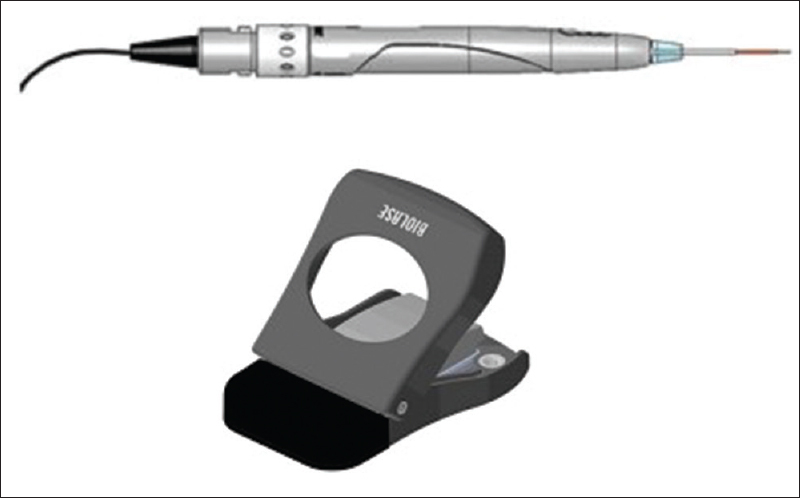 Laser J 2007;2007:16-21.
van Hillegersberg R. Fundamentals of laser surgery. Eur J Surg 1997;163:3-12. Gutknecht N. State of the art in lasers for dentistry. J Laser Health Acad 2008;3:1-5. Kotlow LA. Lasers in pediatric dentistry. Dent Clin North Am 2004;48:889-922, vii. Mordon S, Begu S, Buys B, Tourne-Peteilh C, Devoisselle JM. Study of platelet behavior in vivo after endothelial stimulation with laser irradiation using fluorescence intravital videomicroscopy and PEGylated liposome staining. Microvasc Res 2002;64:316-25. Pick RM, Pecaro BC, Silberman CJ. The laser gingivectomy. The use of the CO2 laser for the removal of phenytoin hyperplasia. J Periodontol 1985;56:492-6. 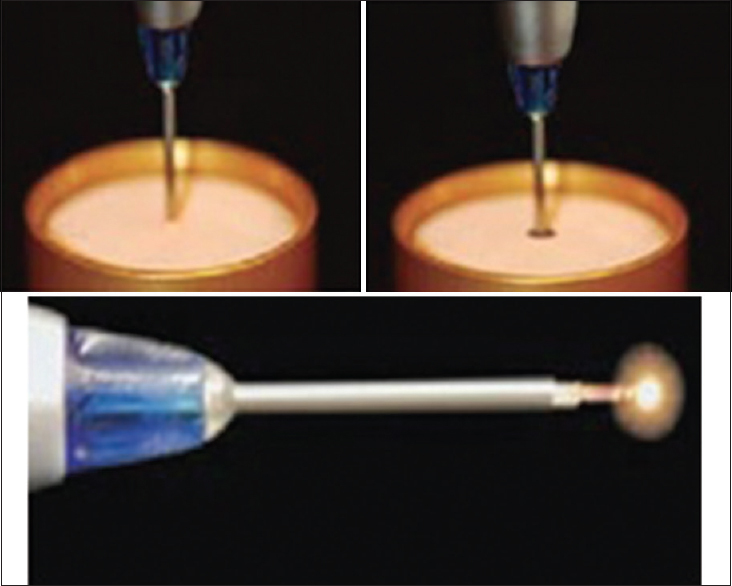 Pirnat S. Versatility of an 810 nm diode laser in dentistry: An overview. J Laser Health Acad 2007;4:1-9. Welch AJ. The thermal response of laser irradiated tissue. IEEE J Quantum Electron 1984;20:1471-81. McKenzie AL. Physics of thermal processes in laser-tissue interaction. Phys Med Biol 1990;35:1175-209. Reinisch L. Laser physics and tissue interaction. Otolaryngol Clin North Am 1996;29:893-914. Schäfer O. The development of the diode laser to the digital pulse technology. Laser J 2008;2008:6-7. Bach G, Koch HK, Hellerich U, Venzke T. conventional diode laser versus high pulse technology. Laser J 2008; 1:18-20. Bach G, Gutknecht N, Schneider H. Laser therapy in the ORALSURGERY. Linnich: Apollonia Verlag; 1998. Stübinger S, Saldamli B, Jürgens P, Ghazal G, Zeilhofer HF. [Article in French, German] [Soft tissue surgery with the diode laser – theoretical and clinical aspects]. Schweiz Monatsschr Zahnmed 2006;116:812-20. Saleh HM, Saafan AM. Excision biopsy of tongue lesions by diode laser. Photomed Laser Surg 2007;25:45-9. Janda P, Sroka R, Mundweil B, Betz CS, Baumgartner R, Leunig A. Comparison of thermal tissue effects induced by contact application of fiber guided laser systems. Lasers Surg Med 2003;33:93-101. Geldi C, Bozkulak O, Tabakoglu HO, Isci S, Kurt A, Gulsoy M. Development of a surgical diode-laser system: Controlling the mode of operation. Photomed Laser Surg 2006;24:723-9. Sarver DM. Use of the 810 nm diode laser: Soft tissue management and orthodontic applications of innovative technology. Pract Proced Aesthet Dent 2006;18:Suppl 7-13. Judy MM, Matthews JL, Aronoff BL, Hults DF. Soft tissue studies with 805 nm diode laser radiation: Thermal effects with contact tips and comparison with effects of 1064 nm Nd: YAG laser radiation. Lasers Surg Med 1993;13:528-36. Alam T, Dawasaz AA, Thukral N, Jangam D. Surgical diode laser excision for peripheral cemento-ossifying fibroma: A case report and literature review. J Oral Laser Appl 2008;8:43-9. Coluzzi DJ. An overview of laser wavelengths used in dentistry. Dent Clin North Am 2000;44:753-65. Kreisler M, Kohnen W, Beck M, Al Haj H, Christoffers AB, Götz H, et al. Efficacy of NaOCl/H2O2 irrigation and GaAlAs laser in decontamination of root canals in vitro. Lasers Surg Med 2003;32:189-96. Capodiferro S, Maiorano E, Loiudice AM, Scarpelli F, Favia G. Oral laser surgical pathology: A preliminary study on the clinical advantages of diode laser and on the histopathological features of specimens evaluated by conventional and confocal laser scanning microscopy. Minerva Stomatol 2008;57:1-6, 6. Borchers R. Comparison of diode lasers in soft-tissue surgery Using cw-and superpulsed mode: An in vivo study. jaypeejournals: RWTH Aachen University AALZ Aachen Dental Laser Institute; 2008. p. 57, 8. Taylor DL, Schafer SA, Nordquist R, Payton ME, Dickey DT, Bartels KE. Comparison of a high power diode laser with the Nd: YAG laser using in situ wound strength analysis of healing cutaneous incisions. Lasers Surg Med 1997;21:248-54.